Another sad thing about 9-11, an awful lot of people have already forgotten it happened: and, even more are too much in denial to imagine that it could ever happen again! I purchased a flag and hung it up this morning. It's flying proud! Those are great photos mom! Thanks for sharing with everyone. I think we remember, because we are losing people to Iraq every day. We need to move on, and stop being afraid of speaking out and getting out of there. Iraq had nothing to do with this and my generation is being ripped up over it. Enough with perversion about those buildings falling. I remember it, we all remember it, we don't remember why we let Congress and George Bush wage a war of fear on the nation and dragged us off to get thrice as many killed. First, in the spirit that jackiemaew meant from the heart this submission to be for, I thank you for reminding everyone! Yes, we were 'attacked' and thousands of innocents lost their lives in the name of power and religion and we can indeed be attacked again! Many, many attempts have been thwarted since 9/11! I am sorry for those whose hearts are aching because of Iraq (I have several family members there and one on his third tour) but if one is going to place a finger of blame on the Bush Administration then you best also a place a finger of blame on the Clinton Administration who had 'several' opportunities and much knowledge for the need to tighten security for our country! Had that security been in place every single one of the hijackers, who were known terrorists, would not have been allowed pilot training and blah, blah, blah to achieve their goals! Enough said! Bless you, jackiemaew! I remember. I even blogged about it, but I had to wait a day, I just couldn't face it on the anniversary. You can read my blog at http:www.starfishrescue.blogspot.com it is the entry on the 12th. 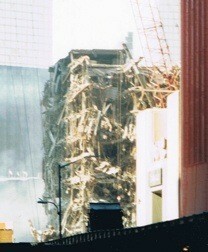 I remember the horror of that day as if it had just happened, even though eight years and many events have intervened. This includes one son's four years and two Iraq tours with the USMC, and a close friend's son's trip with the US Army Engineers. God bless you for keeping those around you in remembrance of the importance of this date. Those who forget the past, are doomed to repeat it. I see the comments and know thats what makes this a wonderful country that we aren't afraid to express our opinions. But I would like to point out one little Fact for those of you who put down Bush for putting our troops in Iraq, um I dont see Obama taking them out. And this is coming from a mother whose son just finished boot camp for the Army. I dont want my son fighting in a war, but I am proud of him for standing up for his country. I remember every moment from that day 8 years ago, the horror and disbelief. I still cry when something comes up about it, its so close to my heart, though I lost no one, thank God. No, I'll never forget that terrible day.